What makes a book town? It can’t be too big—not a city, but a genuine town, usually in a rural setting. 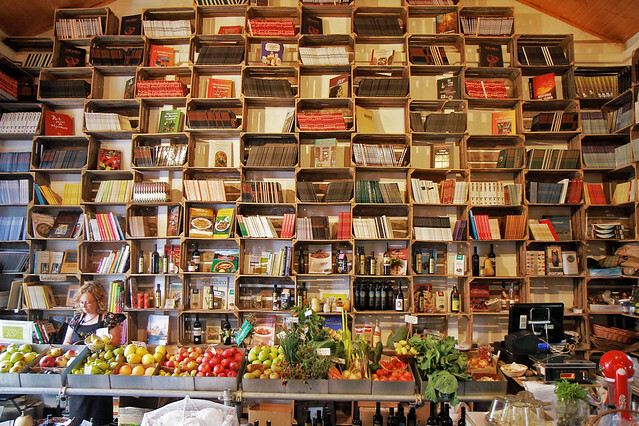 It has to have bookshops—not one or two, but a real concentration, where a bibliophile might spend hours, even days, browsing. Usually a book town begins with a couple of secondhand bookstores and later grows to offer new books, too. As we browse in bliss, we might send a combo birthday and St Patrick’s Day greeting to Catherine “Kate” Greenaway; she was born on this date in 1846. 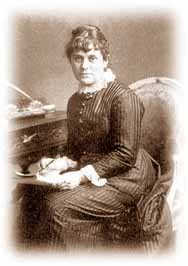 Creator of books for children such as Mother Goose (1881), Little Ann (1883), & The Pied Piper of Hamelin (1889), she was one of the most the most accomplished illustrators of her time– and the inspiration for The Kate Greenaway Medal, awarded annually by the Chartered Institute of Library and Information Professionals in the U.K. to an illustrator of children’s books. 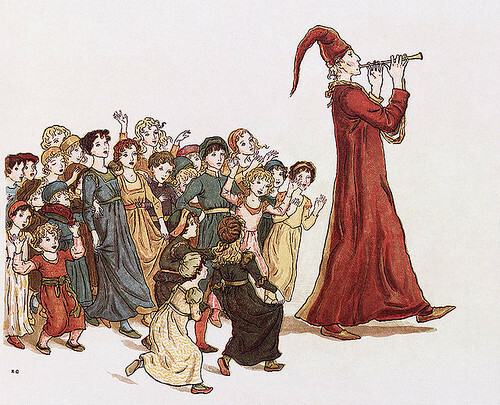 Greenaway’s illustration of the Pied Piper leading the children out of Hamelin; for Robert Browning’s version of the tale. Picture from Presto and Zesto in Limboland, ©2017 by the Maurice Sendak Foundation. Lynn Caponera, president of the Maurice Sendak Foundation, was going through the late artist’s files last year “to see what could be discarded,” she said. “I was asking myself, do we really need all these?” when she found a typewritten manuscript titled Presto and Zesto in Limboland, co-authored by Sendak and his frequent collaborator, Arthur Yorinks. 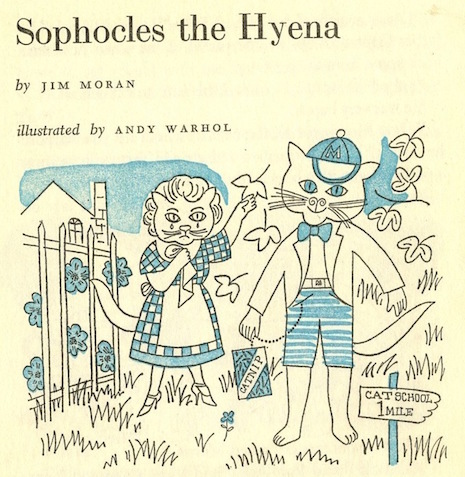 Caponera, who managed Sendak’s household for decades, didn’t remember the two friends working on a text with that title, so she scanned the manuscript and e-mailed it to Michael di Capua, Sendak’s longtime editor and publisher. 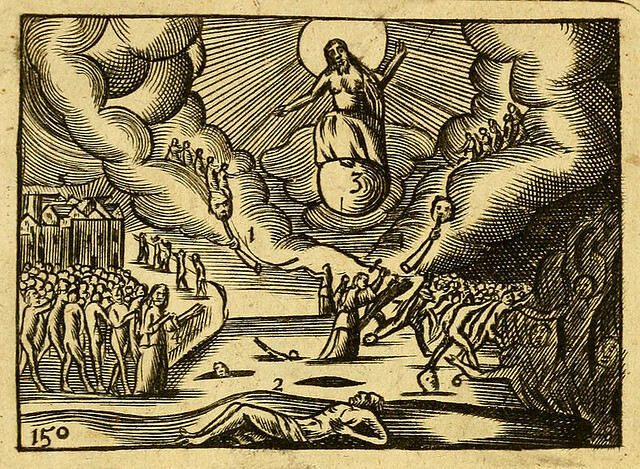 Not only is the manuscript complete, so, too, are the illustrations. 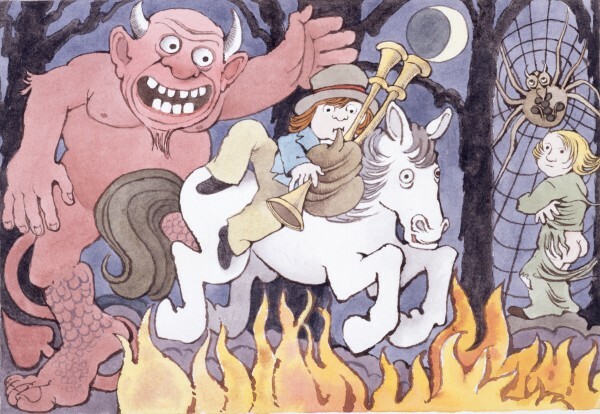 Sendak created them in 1990 to accompany a London Symphony Orchestra performance of Leoš Janáček’s Rikadla, a 1927 composition that set a series of nonsense Czech nursery rhymes to music. As we go Where the Wild Things Are, we might send powerfully-drawn birthday greetings to Colleen Doran; she was born on this date in 1964. A write, artist, illustrator, and cartoonist, she has illustrated hundreds of comics, graphic novels, books and magazines. 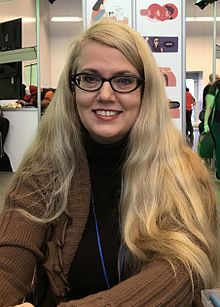 She has illustrated the works of Neil Gaiman (her drawings and adaptation of his “Troll Bridge” was a New York Times bestseller), Alan Moore, Warren Ellis, Joe R. Lansdale, Anne Rice, J. Michael Straczynski, Peter David, and Tori Amos; her credits include: The Sandman, Wonder Woman, Legion of Superheroes, Teen Titans, The Vampire Diaries comics, Walt Disney’s Beauty and the Beast, and her space opera series, A Distant Soil… for which she has received Eisner, Harvey, and International Horror Guild Awards. 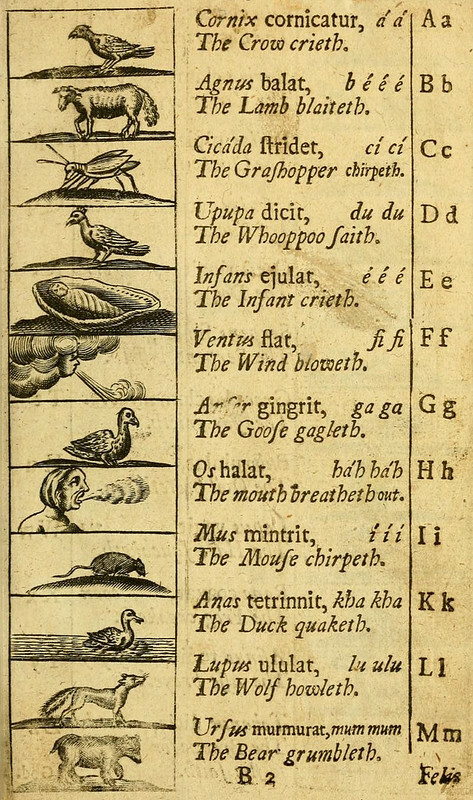 Tommy Thumb’s Pretty Song Book, published in 1744 and now in the collection of the British Library, is the oldest surviving published collection in the genre. Some of its rhymes are still familiar; others, like “Piss a Bed” (above), have faded away. 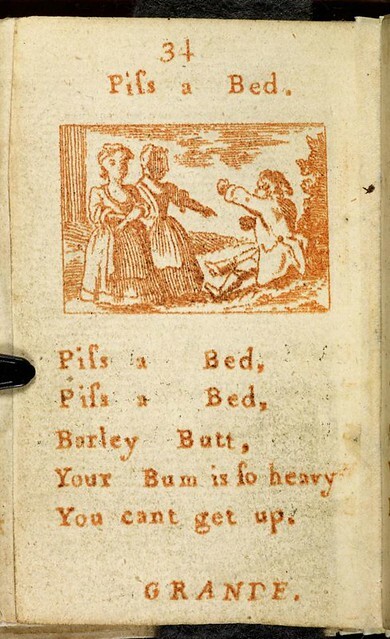 While the mid-18th-century Tommy Thumb’s represents the oldest collection of nursery rhymes on paper, the oral tradition is, of course, much older. In a preface to his 1843 collection of English nursery rhymes, scholar James Halliwell-Phillips could pinpoint the origins of some verses in his collection to the 16th century but believed that some could be “ancient.” Later studies have dated most of today’s familiar rhymes to the 16th through 18th centuries, with some earlier outliers coming from the medieval period. 23 April is a symbolic date for world literature. It is on this date in 1616 that Cervantes, Shakespeare and Inca Garcilaso de la Vega all died. It is also the date of birth or death of other prominent authors, such as Maurice Druon, Haldor K.Laxness, Vladimir Nabokov, Josep Pla, and Manuel Mejía Vallejo. It was a natural choice for UNESCO’s General Conference, held in Paris in 1995, to pay a world-wide tribute to books and authors on this date, encouraging everyone, and in particular young people, to discover the pleasure of reading and gain a renewed respect for the irreplaceable contributions of those, who have furthered the social and cultural progress of humanity. 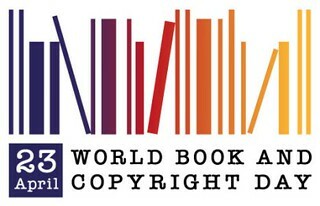 In this regard, UNESCO created the World Book and Copyright Day. In the first decade of the 20th century, Edward Stratemeyer formed the Stratemeyer Syndicate. 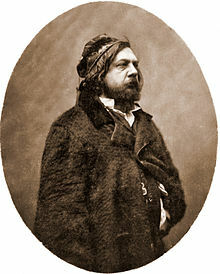 As the head of the group, he commissioned writers to create quickly-written, formulaic juvenile novels; authors received short outlines, and returned book manuscripts within a month. As Meghan O’Rourke writes in The New Yorker,“ Stratemeyer checked the manuscript for discrepancies, made sure that each book had exactly fifty jokes, and cut or expanded as needed,” The syndicate’s popular protagonists included the Hardy Boys,Nancy Drew, Tom Swift, and the Bobbsey Twins, along with many that are now unfamiliar, like the Outdoor Girls, the Motion Picture Chums, and the Kneetime Animal Stories. 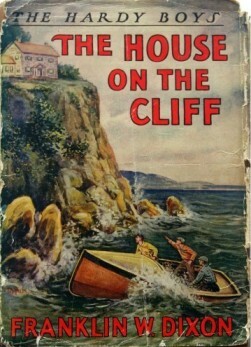 In this two-page outline for the 1927 Hardy Boys mystery The House on the Cliff, Stratemeyer directed writer Leslie McFarlane in the construction of the plot of the second book in the franchise’s original series. The book was officially published as the work of Franklin W. Dixon, a fictional author whose name appears on all of the Hardy Boys books. 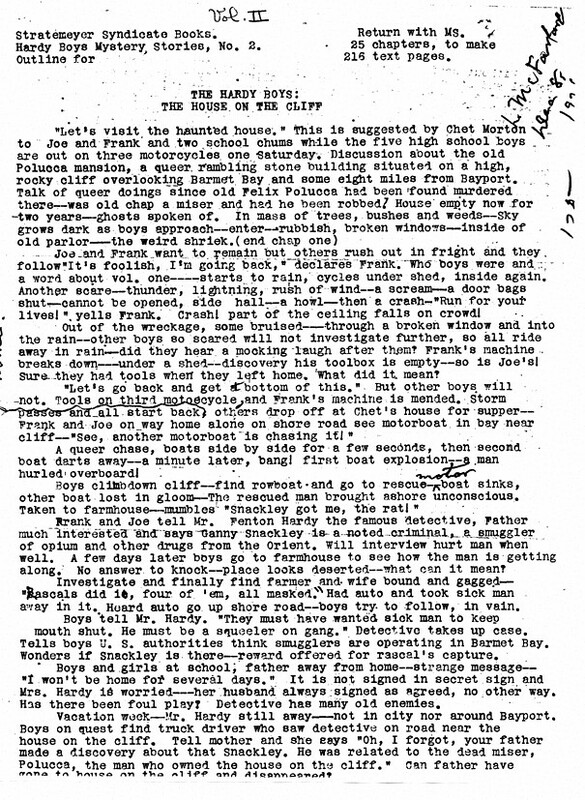 James Keeline, who researchs the history of the Syndicate and granted me permission to run these scans of the Hardy Boys document, has put several other Stratemeyer outlines up on his site. As we turn the page, we might send a combo birthday and St Patrick’s Day greeting to Catherine “Kate” Greenaway; she was born on this date in 1846. Creator of books for children such as Mother Goose (1881), Little Ann (1883), & The Pied Piper of Hamelin (1889), she was one o fte most the most accomplished illustrators of her time– and the inspiration for The Kate Greenaway Medal, awarded annually by the Chartered Institute of Library and Information Professionals in the U.K. to an illustrator of children’s books. 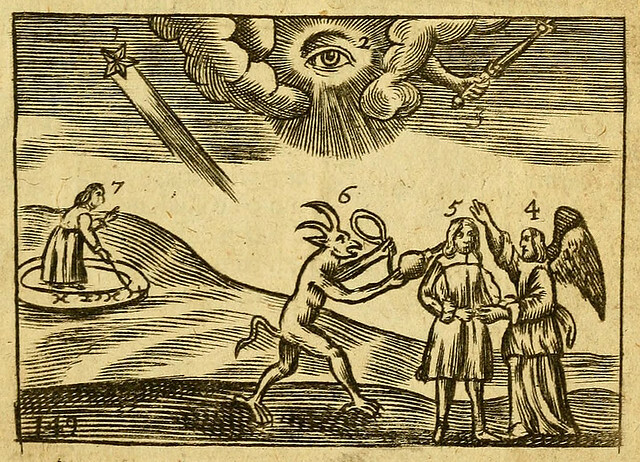 Originally published in 1658 in Latin and German, the Orbis — with its 150 pictures showing everyday activities like brewing beer, tending gardens, and slaughtering animals — is immediately familiar as an ancestor of today’s children’s literature. This approach centered on the visual was a breakthrough in education for the young, as was the decision to teach the vernacular in addition to Latin. Unlike treatises on education and grammatical handbooks, it is aimed directly at the young and attempts to engage on their level. As we see Spot run, we might recall that this the date commonly given for the day that the Pied Piper (Rattenfänger) led the children of Hamelin, Germany, into a mountain cave. and lost at the place of execution near the Koppen. 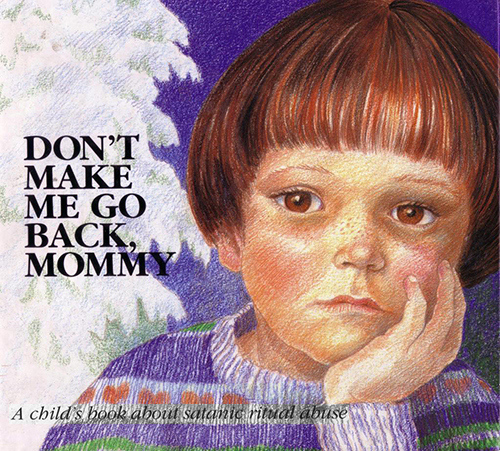 The words of the text and the objects and situations illustrated are based on months of intensive research into the nature and practice of satanic ritual abuse. Any child who has been ritually abused will recognize the validity of this story. 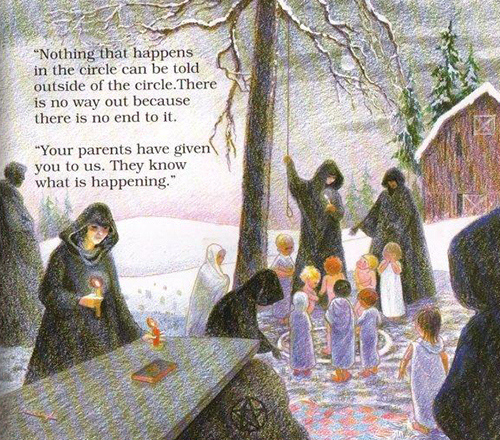 The book was apparently marketed to school counselors, mental health professionals and support groups, as well as to concerned parent, to help identify signs of Satanic Ritual Abuse (or “SRA”). – One HELL of a good read. Devilishly funny. My son, Damian, thought it was the funniest book he’s ever read. An all around great book to read around the sulfur pit with the family. They say you can’t judge a book by its cover, but honestly, LOOK AT IT. 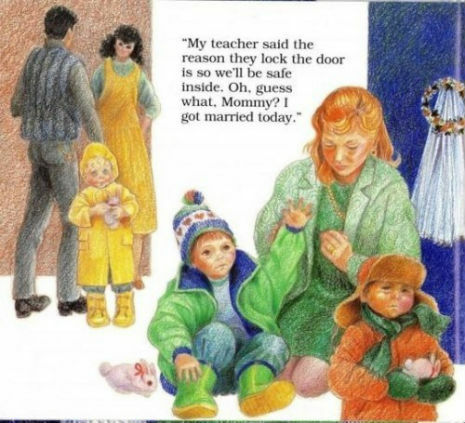 – 4 year old saw this book and she is begging parents to send her to this school, where on earth are we going find a satanist school for the brat. – You have to be a detective to follow the “story.” The book forces you to deduce the storyline from the progression of settings, because the book never tells you what is happening or why, or even who is talking. The child in the “story” just materializes in new contexts without explanation. The reader’s reactions are constantly along the lines of, “Where is she now? What is happening? Who is this person? Who is talking?” Each page introduces a new disjointed scenario and a new unattributed quotation, and it’s up to the reader to try to figure out what’s going on. Via the ever-illuminating Dangerous Minds. 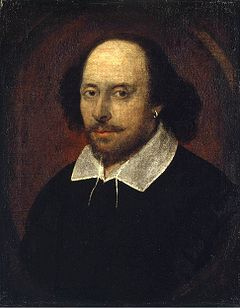 As we make the sign of the cross, we might wish a grateful Happy Birthday to the greatest poet and playwright in the English canon, William Shakespeare; he was born (tradition holds, and reason suggests) on this date in 1564. In fact, there is no way to know with certainty the Bard’s birth date. But his baptism was recorded at Stratford-on-Avon on April 26, 1564; and three days was the then-customary wait before baptism. In any case, we do know with some certainty that Shakespeare died on this date in 1616.